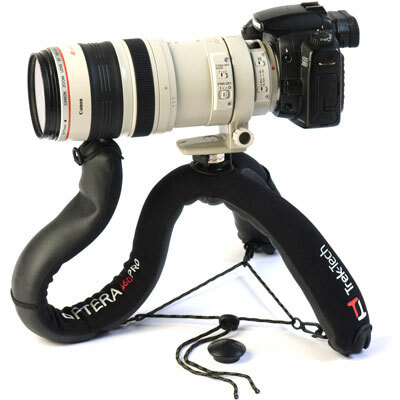 The Trek-Tech Optera-460 Flexible Mini Tripod is a new-generation solution for on-the-go camera support, designed by Trek-Tech's staff of shooters in Portland, Oregon. The Optera-460 is designed to hold equipment of up to 14 lbs, but be aware that any load rating is affected by the weight distribution of the load relative to the support base. In true practical terms, the Optera-460 can handle modern SLR cameras together with a large telephoto zoom lens with a tripod collar, such as a 80-400mm f/4.5-5.6, 100-300mm f/4, 70-200mm f/2.8, or 150-500mm f/5-6.3 (it is not for a 300mm f/2.8 or larger). There are other ball-and-socket miniature tripods on the market, but the Optera-460 has a few unique tricks up its sleeve. For starters, its ball segments are encased in foam and wrapped in fabric for some durability, but it is also true that for smaller cameras these same leg segments as they are can double as a practical roll cage for your camera in a crowd. The leg segments have rubber tips for added traction, as well as a hook/D-ring system on the inside which, together with the included elastic cord, can tie on to nearby objects or just add a smidge more stability. One of the three leg segments on the 460 is twice as long as the others, acting like a monkey's tail to wrap around a fencepost or to come up and support a tripod collar. 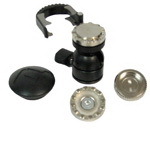 But the best feature of all is Trek-Tech's MagMount PRO quick release system, which uses magnets instead of any button/lock assembly-just grab hard and pull up to disconnect, or bring base and plate near one another to connect. The system's simple and secure. The Optera-460 includes a standard quick release plate for lighter cameras and a heavier-duty plate with a stronger magnetic pull and an anti-rotation device system for your bigger stuff. The underside of the heavy-duty plate has notches every 30° allowing a makeshift panorama or two. There's also a locking collar for the plates, which joins the plate and base together so securely that even inverting the tripod in your hand with camera attached would be of no concern.